To catch you all up, I am a Type 1, insulin-free, Diabetic managing my diabetes through a Paleo diet and healthy lifestyle. Over the holidays of 2017, I was exposed to dairy for about 8 weeks. “Exposed” sounds accidental. It was, but it was my own fault for not vetting my candy choices more carefully! This resulted in higher blood sugar levels overall, but especially in my fasting blood sugar which is taken first thing in the morning. Eliminating the candy from my diet didn’t yield improved enough blood sugar levels so on February 19, I began the 30 Day Autoimmune Protocol (more information on AIP) again to heal my gut and get my blood sugar levels back under control. Check out how Week 1 went here! See my daily progress by following me on Instagram! 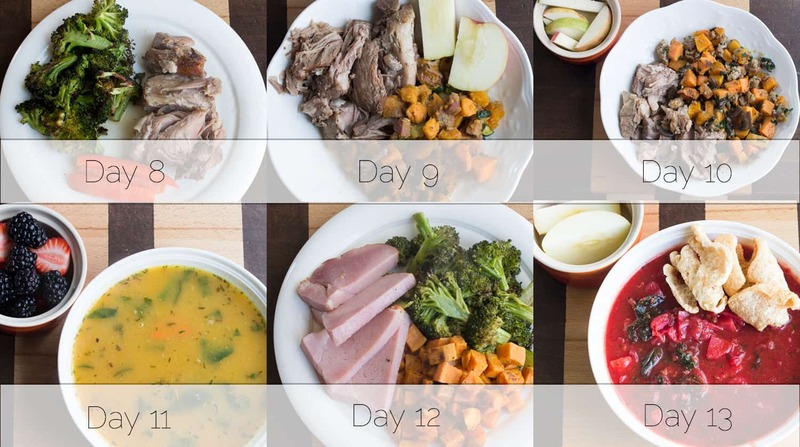 Week 2 of the Autoimmune Protocol (AIP) was even easier than Week 1, and MILES easier than when I attempted the AIP diet in October 2017. I began to see more blood sugar control this week. Except the night the family went out for sorbet, I was high that night, but my blood sugar recovered nicely on it’s own without the help of artificial insulin. At the end of the week, I even saw another fasting blood sugar level less than 130! Woot! I’ve had 3 fasting blood sugar reading under 130 since beginning the diet, and I haven’t seen levels that low since November 2017. Yikes, I let this problem go on for far too long! As with the review of Week 1, I will review the food I ate, how my blood sugar fared, how I felt this past week, and my goals for the next week. First up, Food! 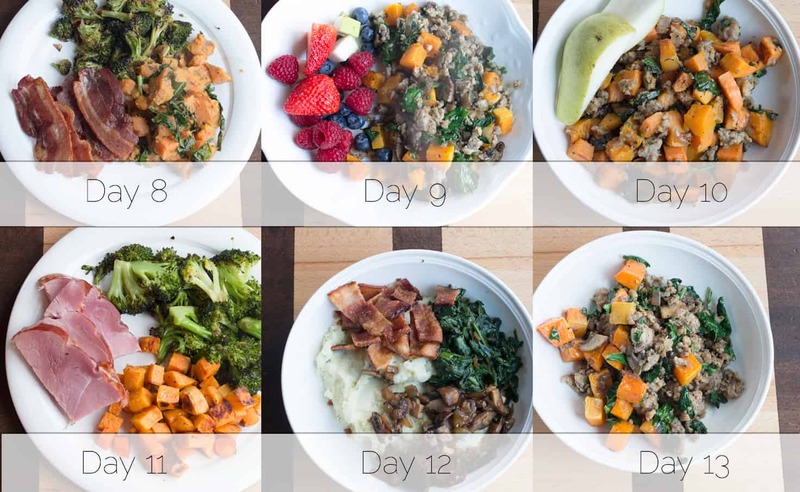 The variety of breakfast food this week was extremely satisfying to me: from delicious fresh fruit salad on Day 9 to roasted broccoli AND sweet potatoes on Day 11 to savory cauliflower mash on Day 12. I really enjoyed the variety of vegetables and flavors this week. I made two different types of hash this week. One simple with sweet potatoes, onion, and kale, and the other more involved with roasted butternut squash, sauteed mushrooms, breakfast sausage, and spinach. Both stood alone just fine and were filling and satisfying, but there was a little part of me wishing for a yoke-y egg on top. Sigh. Soon. Dinner out on Day 12 did not follow the Autoimmune Protocol. I had egg and refined sugar in the dessert. The dinner qualifies as Paleo but not with the extra restrictions of the Autoimmune Protocol. I did end the night of Day 12 with great blood sugar (126! ), but my blood sugar was elevated all day on Day 13. While this is not the end of the world, I am trying to keep note so I will know exactly how food affects my body (This is one of my goals for 2018!). It was my goal at the end of Week 1 to include fish and organ meat, but I accomplished neither. Oops. I opted out in favor of staying on budget. Seafood in Michigan is not cheap (is it cheap anywhere??? ), and I didn’t hunt too hard to find organ meat. I still need to work on putting on my big-girl pants for that one. Overall though, the week was filled with delicious food. Look at the color variety in those pictures! It was a tasty week! Nightshade-free Vegetable Beef Soup – This was hands-down my favorite recipe this week. The color was stunning, and it even fooled my husband! His first comment when peeking in the pot before dinner, “I thought tomatoes were out of our diet right now? !” It was super tasty and filling. All four of us went back for seconds. The only caveats I would add are (1) it was time-consuming to make (2 hours) and (2) it made at least 12 servings (The recipe says 6-8. No way, we might even get 15!). I totally don’t mind either of these conditions. It was delicious; therefore, well worth my time. Also, we love leftovers! Roasted Vegetable and Chicken Soup – This soup has a wonderful complexity to it due to roasting the vegetables first then pureeing half and adding the puree to the broth. This was in our regular rotation prior to starting the Autoimmune Protocol. I was thrilled to read through the recipe to see that it was still AIP compliant! Super delicious soup. Try it! Mashed Cauliflower Breakfast Bowl – I was looking for different breakfast options other than hash, and I stumbled upon this cauliflower mash. It was delightful. It kind of reminded me of oatmeal in that it was hot and mushy, but the savory flavors were out of this world! I absolutely love sauteed mushrooms and bacon. They are a perfect combination! The only note I need to make is follow the seasoning ratios. I tend to pour spices in my palm to measure, and I overdid it a bit. The cauliflower mash was not just savory. It was SAVORY. I’ll scale back a bit next time! Improving my overall blood sugar level AND reducing my morning (fasting) blood sugar are the primary reasons I am doing the Autoimmune Protocol. That is what diabetes is all about: blood sugar management. I made improvement in my fasting blood sugar this week. I had 3 mornings with readings less than 130! That is a major win for me! You’ll notice a spike in the blue, squiggly line. That is the night my husband and I took the family out for sorbet. My blood sugar was high at bedtime (199! ), but it recovered just fine by morning (144). If you ignore the sorbet spike, week 2 looks just about the same as week 1, a little lower at times and a little higher at times. The pattern looks the same though. I’m also counting this as a win and calling it blood sugar control. My blood sugar is following a predictable pattern each day and throughout the day. For reference, the squiggly lines show the fluctuation of my blood glucose readings throughout the day, and the straight line of the same color is showing the trend of my blood sugar levels that week. Red is week 1, and blue is week 2. 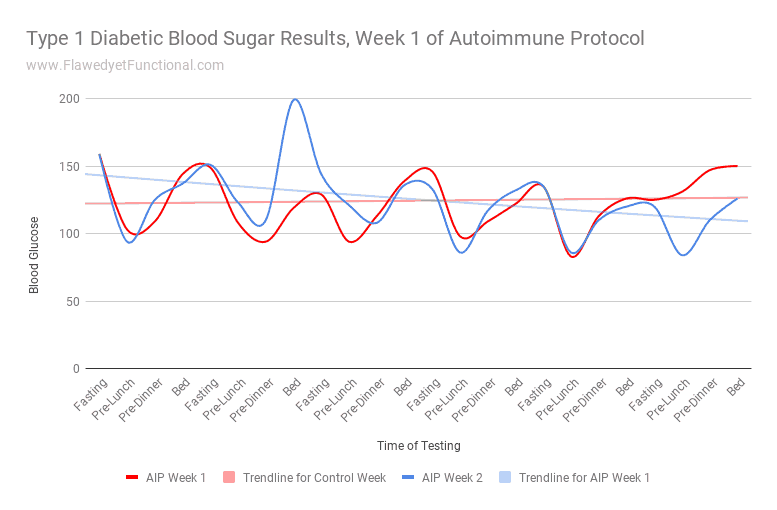 Conclusion: The Autoimmune Protocol diet is creating more stable blood sugars. Other than outlier of sorbet, my blood sugar is following a predictable, stable pattern for a Type 1 Diabetic. I am so thrilled by more on-goal fasting blood sugars. I’m hoping to see those more consistently in the coming weeks. I’ve noticed this week on the days I wake with a blood sugar level of less than or around 130, I have vastly more energy to work out. I’m usually still asleep a bit and a tad not-wanting-to-workout when I begin my morning workout. The mornings my blood sugar was 136, 132, and 120, I was raring to go the entire work-out. That was odd to me, yet invigorating! My husband has asked before if I feel different when I’m around 100 as opposed to 150 or 170. I’ve always told him no, I feel the same if I’m below 300. There’s no difference. After this week, I think there might be a difference in my level of energy! I will have to keep tracking this to be sure. Do you want endless energy??? I think you should give this diet a try! (Or even just the less strict Paleo diet if you don’t have leaky gut. Actually, start with just not eating wheat!) You will be a whole new person! For Week 3, my diet will not see any major changes. The focus will continue to be on eating a good quantity and variety of vegetables that are Autoimmune Protocol approved. Seafood and organ meat were not in Week 2, and due to budget constraints, I have to make the same decision in Week 3. The huge win for the week was fasting blood sugars of 130 or less in the second half of Week 2, so I’m hoping that means my gut is healing. I’m hoping to continue to see blood sugar level improvement for the morning readings. I am so pleased with these results. I’m eating well and enjoying my food. I am not stressed by the diet, and I’m seeing results. What more could a girl ask for?! 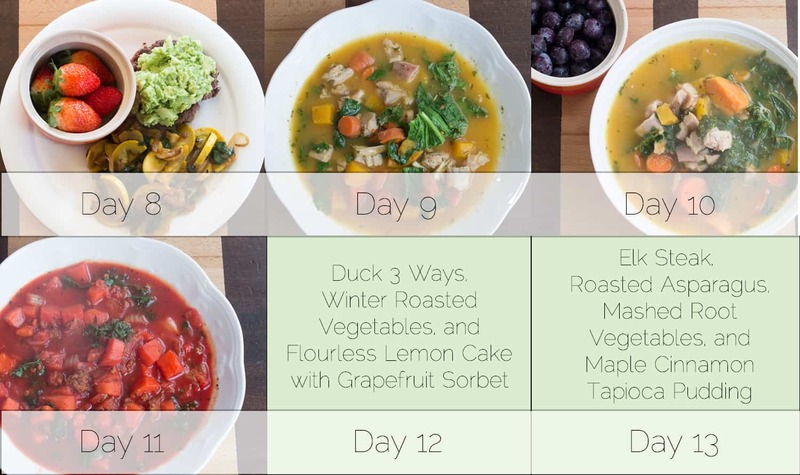 That wraps up my second week on the Autoimmune Protocol 30 Day Elimination Diet! Check out Instagram to see how my progress goes each day! For a review of Week 1, click here. Do I have any diabetic readers out there who’d care to share what your typical fasting blood sugar levels look like? What strategies have you tried to maintain control of these levels? Is this the most difficult reading of the day to manage? For my non-diabetic readers, what you working to change in your diet to make your diet move in the healthier direction? More veggies? Cleaner ingredients? Grass-fed meat? What successes have you had lately?? Any suggestions for meats/veggies I should try?